Milk Protein Isolate, Calcium Caseinate (Milk), Wheat Glutamine (Wheat/Gluten), Sodium Caseinate (Milk), Inulin, Maltodextrin, Emulsifiers (Acacia Gum, Sunflower Lecithin), Vanilla Flavouring, Sweetener (Sucralose), Triacetin, Anti-Caking Agent (Silicon Dioxide), Alpha Amylase, Lactase, Cellulase, Protease, Lipase. No Artificial Colours, Preservatives, Yeast, Fish or Porcine. 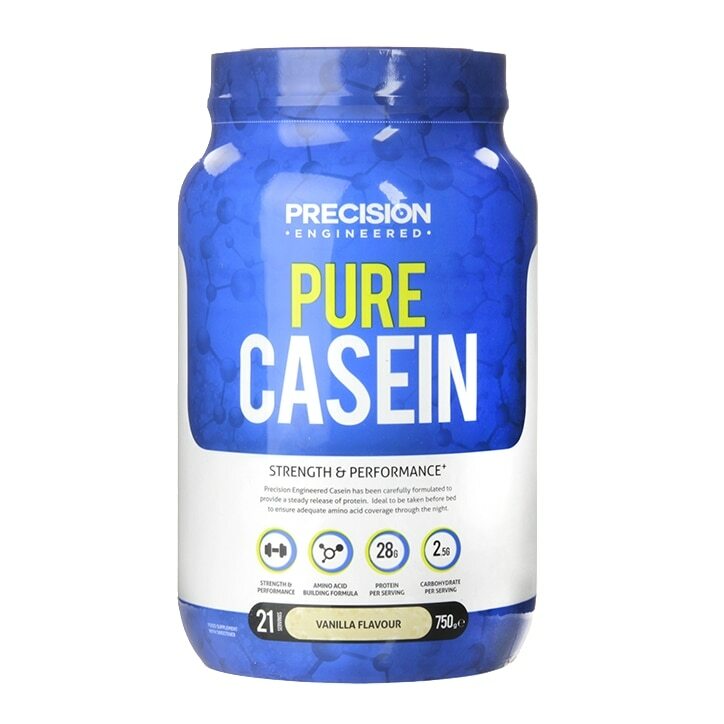 Precision Engineered Pure Casein Powder Creamy Vanilla is rated 3.5 out of 5 by 4. Rated 3 out of 5 by Gymboy from Bought on offer Not tasty. Makes a thick shake /emulsion and supposed to be taken at night. Rated 1 out of 5 by Fairanalysis from Taste awful! Didn't try all the existing casein product but this one is clearly the worst I have tried. I have tried to mix it with sugar, with cocoa powder, with honey... No luck! Still taste really bad! It is also quite difficult to mix. For a product you want to have each evening get something else. Really disappointed! Further more it wasn't cheap! In my opinion: AVOID!